Alani (Melicope knudsenii) germinating seedling. Alani (Melicope knudsenii) seedling in tube. Recently this past month, 4 seedlings that descend from the Fleming Arboretum Melicope knudsenii tree, were sent back home to Maui. Martha has graciously offered the seedlings to Art Medeiros for his Auwahi Restoration Project site where the last wild Melicope knudsenii remains. The seedlings are still pretty small, about an inch in height and in two inch pots so it may take a little bit before they can be outplanted. If anyone is curious, I’ll clue you in as to how we germinate the seedlings in the lab. The seeds are washed well with water then soaked for a bit. This is just to make the outer brittle papery layer easy to scrape off. Once we have it all scraped clean, we soak the seeds in a 10% Clorox solution for about 30 minutes. Then we dip the seeds one at a time in alcohol and give them a very brief flame. They are placed onto culture medium (1/2 strength Murashige and Skoog) and allowed to sit for about a week like this. Once we are assured they are sterile, we go in and nick the seed coat to encourage germination. Germination starts within a couple days or so once they are nicked. The seeds do not germinate all at the same time, so we go through the dishes and harvest the seedlings intermittently. Once they are grown enough in the test tube, the seedlings are brought to the greenhouse where they are taken out of the tubes, rinsed with water to remove the agar medium on the roots then planted into 2-inch pots. The mix is a 1:4 vermiculite/perlite mix. We have to make the mix relatively light because we then place the seedlings onto our mist bench to acclimatize them to the outside environment. Once they start growing again, we slowly remove them from the mist bench onto a reqular greenhouse bench. I would like to thank Fleming Arboretum for their wonderful kokua and generous provisions of Alani seeds. And, the U.S. Fish and Wildlife Service, the State of Hawaii Dept. of Land and Natural Resources, and the Institute for Museum and Library Services for their generous funding for propagation research. Lyon Arboretum’s Micro-propagation Laboratory has been the fortunate recipient of many of the healthy seeds produced by Fleming Arboretum’s rare Alani (Melicope knudsenii). With only a single wild individual barely surviving on East Maui left, the seed production collected from Fleming’s carefully cultivated tree will be invaluable in providing seedling stock for the recovery of this species. 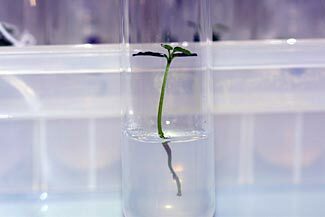 With very little prior knowledge about the propagation of this species, we attempted to germinate the valuable seeds in the laboratory utilizing sterile tissue culture techniques. 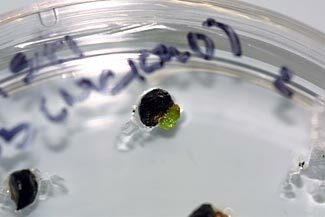 The quality and quantity of the seeds submitted from Fleming has given us a rare opportunity to experiment with different culture media, sterilizing regimes, and germination enhancing pre-treatment, for the sole purpose of optimizing the conditions for germination and seedling production in the laboratory. We have developed a pretty reliable basic protocol for the germination of Melicope knudsenii and currently have approximately 20-25 seedlings of Melicope knudsenii growing in the lab. We plan to establish most of these seedlings in our greenhouse and send them back to Fleming Arboretum and their collaborators. We will keep a few in the laboratory and continue to improve on what we have established as well as develop a cloning protocol for multiplication of Alani plants.